Looking for Christmas cakes ideas this holiday season? We have the perfect December activity for you and your kids that results in a healthy-ish holiday dessert. 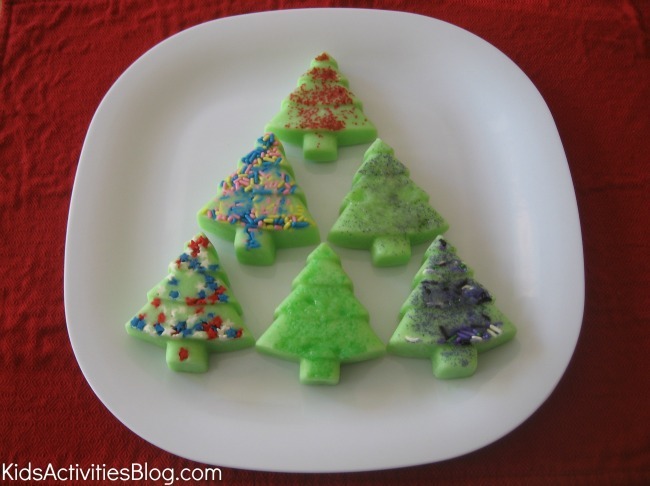 Yes, we here at Kids Activities Blog do recognize the issue of overloading children with desserts over this season. That is one of the reasons why we LOVE this creative idea that your kids are going to embrace. We love to desserts at my house especially around the holidays! With all the cookies and cakes that appear around this time of year it is nice to serve a semi-healthy dessert to serve your family. My husband and son love frozen yogurt so, JDaniel and I created a frozen yogurt Christmas tree treat. 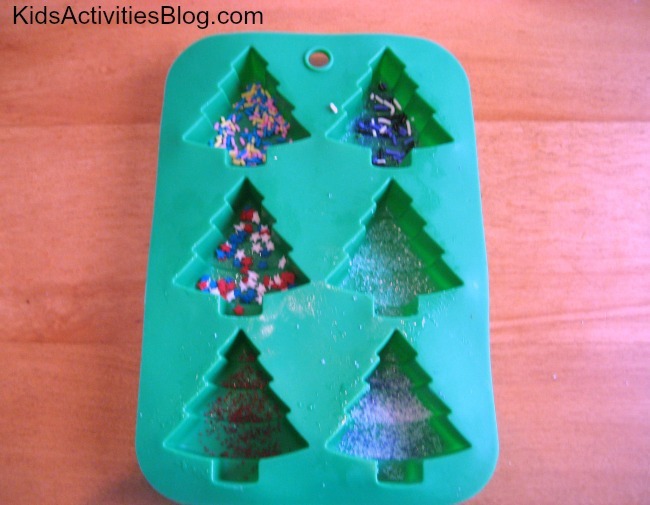 We started the treat creating process by rubbing vegetable oil into the tree shape cups of a Christmas muffin tin. We dabbed a paper towel with a little bit of oil and rubbed it into each nook and crevice. We could have used a spray can of oil, but I was afraid we would miss a spot. My son had a grand time using a variety of sprinkles we had in our pantry to decorate the bottom of the muffin cups. I think he used some Easter and 4th of July sprinkles as well as various colored sprinkles. Any sprinkles would have been just fine. 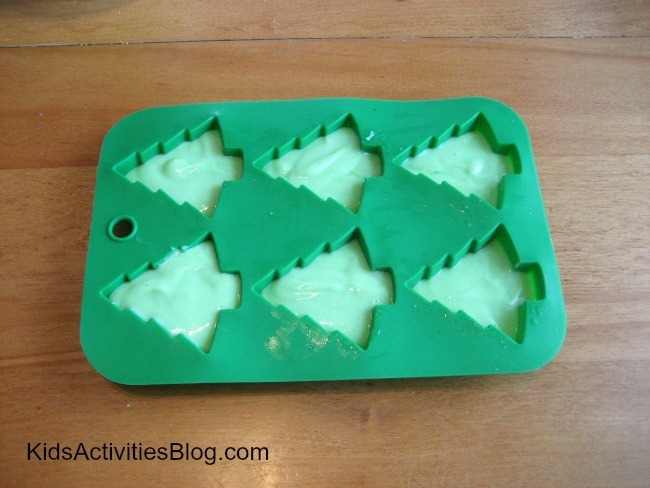 Then he mixed 1 3/4 cups of vanilla yogurt with 1/3 a package of lime jello until the mixture turned green. If we had wanted a darker green we could have added more lime jello. The mixture was spooned into the muffin cups. We filled the muffin cups almost all the way to the top. We didn’t fill them all the way to the top because the mixture will expand a little. After a few hours, we took the treat out of the freezer. They were solid, but not rock hard. 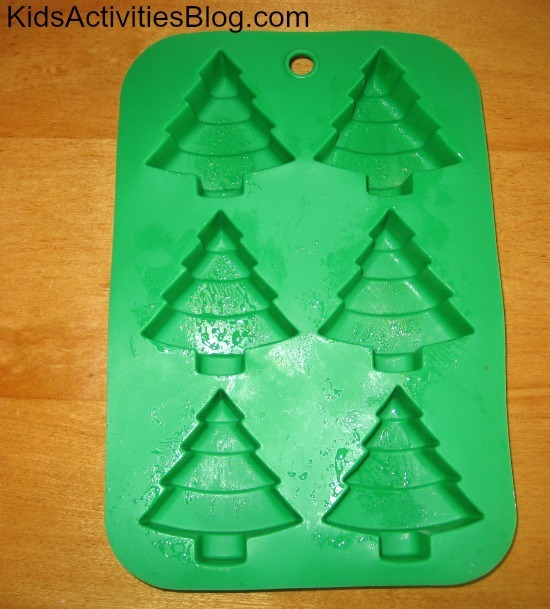 Getting the trees out of the muffin tin was easy. The oil we coated the cups with kept the wall of the cups slippery and the flexibility of the silicone muffin tin made it easy to push the bottom of the cups up to release the treats. We were thrilled to see that the sprinkles had become embedded in the treats. I bet you can make wonderful holiday treats too. Snowman Magnetic Picture Frame to Make and Give…or keep. These look great! 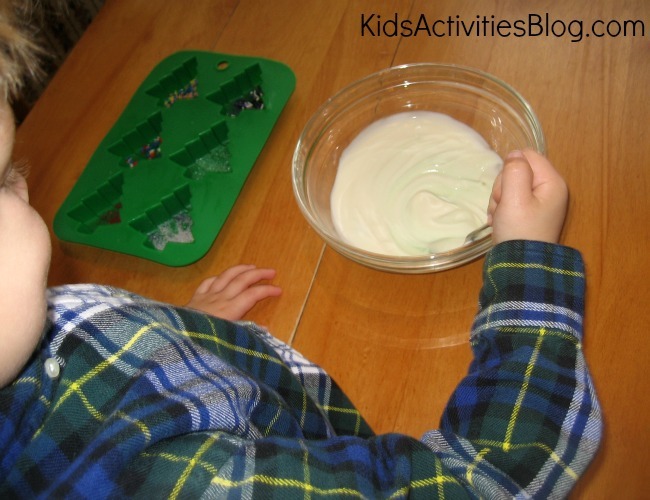 I love the idea of using yogurt as the base for a sweet treat. They look so pretty too.